The historic monastery of Saint Anargyri (Cosmas and Damianos after their Mother Theodoti), is located on a plateau of mountain of Parnonas (Stamatira hill), at an altitude of about one thousand meters. The existence of the place of worship of the Monastery is attested as early as the 9th century (881 AD), the distinguished life of Saint Elias the New Siculus, who for a time near askitepse (First International Scientific Meeting, March 14, 2009, Sparta, which shows the identification of space with the detailed description in the life of Blessed). Second witness and an important source for the history is kept to the edict of Emperor Andronikos II Palaiologos, the year 1293, where validation of benchmarks of the Metropolis of Monemvasia. The life of the monastery went through several phases adventurous, sympaschontas the flow of historical time. The proprietary inscription informs that the Monastery is Stavropegic and the name of Patriarch Konstantinoupoleos Cyril Loukareos. The Cathedral is destroyed and rebuilt during the Turkish occupation (witness the old seal of the Monastery) in 1611. The church is «single spaced, cruciform troullaios, astylos, triconch» and has features of post-Byzantine architecture (diast. 11.50 X5, 45 m and height to the base of the dome 5.50 m). Hagiographies from the famous family of Kakavas, by country of Nafplio. The proprietary inscription states that was painted in 1621 and signed by the leading family Dimitrios Kakavas. Issues, more than a hundred, covering all surfaces of the walls, the floor-to-ceiling. By Fotis Kontoglou, forms «have a strong laikin pnoin, askitikin rigor and are often full of passion and exudes religiosity deeper oftentimes and Athonite paintings. By Tassos Gritsopoulos, the Catholic Monastery «unconscionably interlocked the national and popular life with the Christian. So unsmiling forms encountered by the environment of national gloom. Since 1685, the monastery is suffering from Venice (Fountain), but also Turks, because on both sides, national and spiritual action is inexcusable. Despite the destruction or rebuilding Monastery Continuing multi-pronged bid. The existing wooden temple is the work of 1711 and certifies another peak period of the monastery. 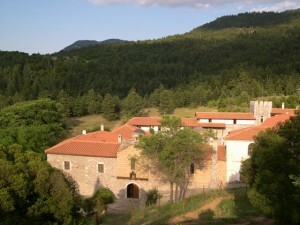 From the 17th century routinely operates in this illegal school until the liberation.’s Significant position Monastery evidenced by the existence of patriarchal sigillia (Gabriel of c 1707, Gregory C 1798 and 1819), which indicate the important role and work, who did the rescue of the Greek tradition for the suffering people of the region. Is remarkable regulations of the monastery. 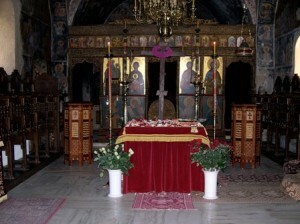 Sigillio also determined the privileged status of the monastery and its relationship with the Ecumenical Patriarchate. In all the difficult moments of the Monastery of the genus except spiritual lighthouse stands as comfort and shelter to the suffering brethren of the rich then regional communities. Always, but particularly during the Great week, the monks offer large quantities of feed required, hosting and parigorontas the passers and pilgrims flocking, especially in the fairs. Separate out the contribution of the Monastery of the Revolution of 1821. Besides functioning Hidden schools and varied offer penomenon as shelters, and names diokomenon fighters, monks personally involved in the liberation struggle. This is confirmed, as reported by Phaidon Koukoules, the existence of the file names of six fighters monks, brothers of the Monastery, where he was given honorary excellence. Of the many former monastic treasures currently not preserved anything. Others were stolen, others were looted during the various invasions (last in November 1943), but also in other way all the precious relics were removed to. The last of the Monastery Archimandrite Groumpos Nicodemus (1900-1964) managed to renovate significantly. 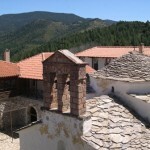 He restored the bell tower of the Catholic, built the Chapel of the Holy Apostles (featuring works by Fotis Kontoglou) and built a fundamentally Metochiako the old church of the Ascension of the Lord on top of Stamatiras. Elder Nicodemus ascetic living, with holiness and heroism; gave new spiritual splendor in the historic monastery. After his death Monastery decline, there remains no monks and used the Cathedral as a place of youth camps. In 1990, the constant concern of the relevant Metropolitan of Monemvasia and Sparta by Mr. Efstathios, and filagianargyritikes actions known Laconian writer Sarantos Kargakos, installed new monastic brotherhood. Faithful, therefore, historical depository of Monastery continues its multifaceted work. Apart from staffing and spiritual rebirth of, accompanied by research and publications, and the effort fits in restoration, renovation and reconstruction. Restored the three existing aspects of the complex and restored the ruined buildings and cells. Significant new functional areas (Bank, Escorts, Portariki, Chapel Presentation of the Virgin and St. Catherine). Moreover rebuilt east wing (Chapel St Anne, monks, Three floor library). With the kind donation of the Stavros Niarchos Foundation «replaced the roofs of most rectangular building complex and the Library building progressed. With new projects and following traditional monastic architecture, the monastery now exists as a quadrilateral regional st ructure, in which a central position held by Catholic. 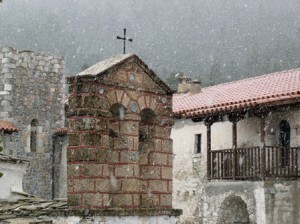 Near the monastery anigerthisan fundamentally a) the seat of St. John of the Ladder to the old threshing floor, b) the chapel anniversary Prodromos the large cedar tree, c) Metochiakos Church of the Holy Trinity and St. Nektarios, and adjacent d) Cemetery connection with ossuary. 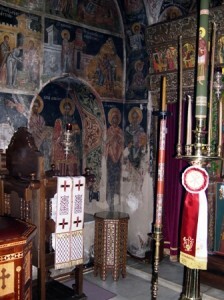 well preserved frescoes of all by the 5th Society of Byzantine Antiquities and decorated the chapels of the Holy Apostles by Fr Nicholas Panos, as well as St Anne, together with the Bank of the monastery by G. Kordis. 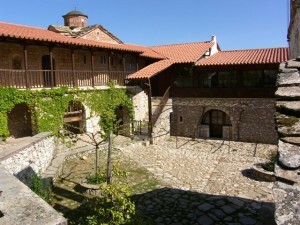 The Monastery is dedicated to Saints Anargyri Cosmas and Damianos after their mother holy Theodoti, deriving from Asia Minor originating (November 1). Because of the difficult weather conditions in November, celebrates and 1 July (Anargyri field day Saints Cosmas and Damian, ex Rome). 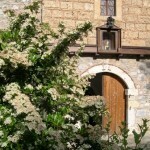 The monastery is open from sunrise to sunset, except the hours of 12:00 p.m. – 4:00 pm.